heard a great story this weekend from a friend of a friend who is working like a madwoman in architecture grad school about her favorite doctor story. when she lived in NYC, she biked from brooklyn to manhattan as her daily commute to work, often amongst throngs of other bikers. 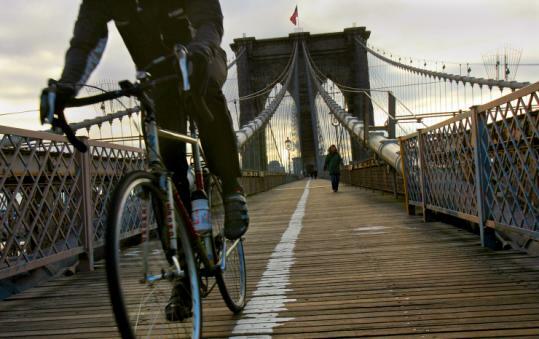 One day, she was biking over a bridge, when this guy speeded past her on his bike, and before she had time to be annoyed, his bike was lodged in the metal fencing of the bridge and he was sprawled out on the concrete on his back. according to her, all the bikers (and walkers) stopped immediately in shock and were moving towards calling 911 when a short man on a road bike skidded to a stop in front of the man lying on the ground, dismounted from his bike, took off his helmet, walked past the open-mouthed bystanders, bent over the man's body and said, "Hi. My name is Daniel. I'm a doctor and I'm going to stay with you until we make sure you're okay". this friend said at that moment she wasn't sure if she wanted to be like him, marry him, have him as her father or create a shrine to him - but in that moment, a calm comfort fell over the people on the bridge and everyone knew everything would be okay. at what point in this "becoming a doctor" journey will I feel capable of that? What a powerful goal though, right? This is a moment of zen. I just cried. Beautiful.